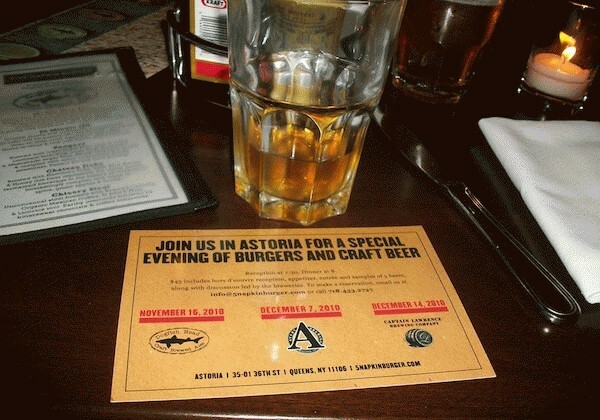 Not even a mucus-secreting, schtuffy-headed, about-to-be-but-not-really-yet cold could prevent me from attending the first beer dinner at 5 Napkin Burger’s newest location in Astoria with craft megapower Dogfish Head Craft Brewed Ales last night. The five brew event began with Shelter Pale Ale?Dogfish’s “original beer,” served for the first time in eight years as an homage to their “less successful times,” according to New York Brand Representative Elizabeth Lyons?and motored through with Chateau Jiahu (my favorite, a floral-nosed, honey-and-sake-tasting beer representative of the oldest known fermented beverage in history), Pangaea, 90 Minute IPA and Chicory Stout, all while munching on yum-yum hors d’oeuvres like deep fried pickles and pastrami and pork tacquitos, and following with entrees like the Original 5 Napkin Burger with cornmeal-crusted onion rings. What I hearted most about 5 Napkin, as it was my first visit to the joint, was its ambiance?especially the initial cocktail area where the first two beers were served, with its assorted butcher scales, half-rotted lightbulbs and meat hooks dangling above in muted light. Kudos for an ill event with ill beers.